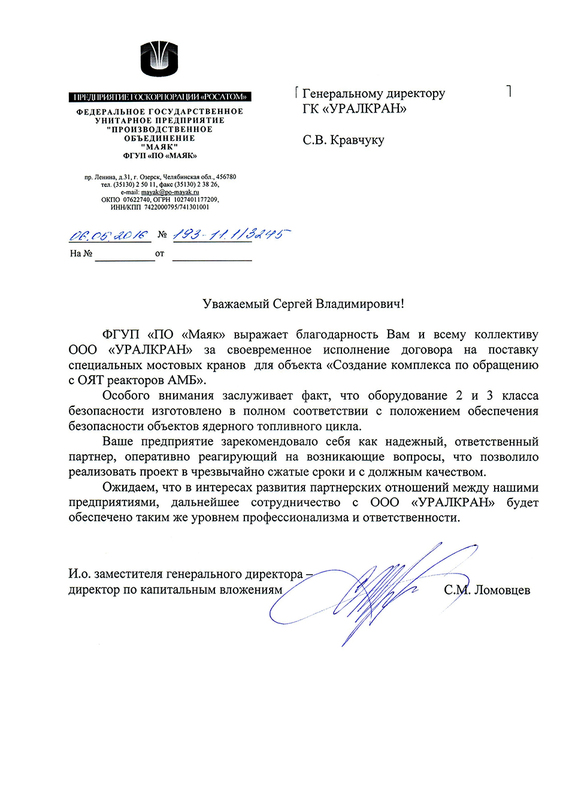 Atomenergoproject Nizhny Novgorod Engineering Company OJSC expresses its gratitude to Uralcrane-Service LLC for the high-skilled mounting of an overhead crane with loading capacity of 370 metric tons while implementing the construction project of CCGT-400 generating unit of Yuzhnouralsk State District Power Plant No. 2. 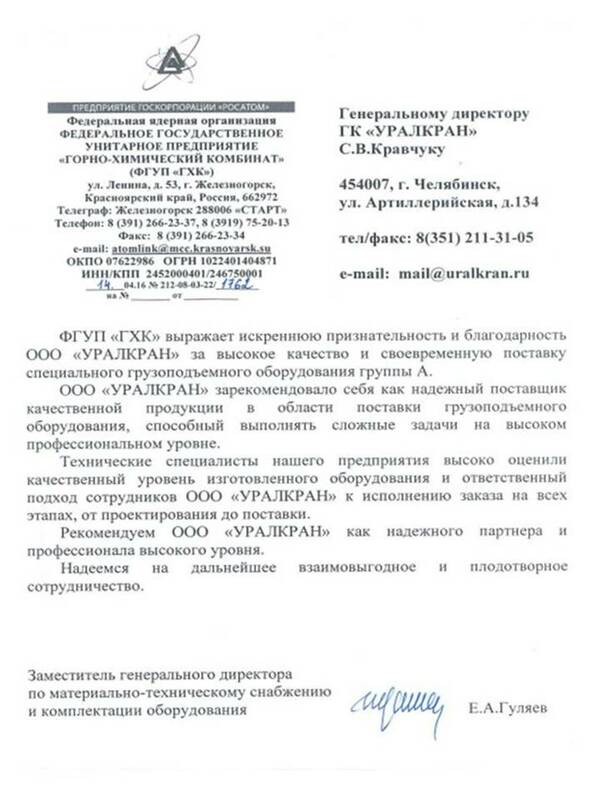 Feedback from Krasny Oktyabr OJSC Complimentary remarks made by Krasny Oktyabr OJSC on prompt and high-quality mounting of an overhead crane by URALKRAN. Mounting of URALKRAN overhead cranes at reinforced concrete constructions workshop of Altay Branch of Sibmost OJSC Complimentary remarks on crane mounting and professionalism of the Service Department. The URALKRAN overhead load-lifting crane was commissioned on Cherepovets site of Severstal-Metiz (article in the SEVERSTAL OJSC corporate issue No. 14 as of October 1, 2010). "Urals specialty. On the carbon section finished products warehouse of the Cherepovets' area "Sever-metiz" there began the realization of the project of the electric bridge crane #44 replacement, which is worn out. New crane is designed and manufactured according our technical requirements on LLC "URALKRAN" (Sukhoy Log), preparations for the startup are going at full speed. According to the words of Sergeij Elistratov (Chief Technical Supervision Engineer), the purchase of the crane was preceded with exploratory trips to the factories of other prospective suppliers. Among them, it is "URALKRAN", possessing all necessary engineering capabilities, up-to-date high-tech equipment, flexible approach towards customer's demands and desires, that was chosen as a bridge crane supplier for the Cherepovets' area. Steel constructions of the new crane, with total load more than 30 tons, are already assembled on-site in partnership with OJSC "Metallurgremont". At present on the warehouse site electric installation and commissioning and start-up are going at full speed – by efforts of workers ORiTE. As its predecessor, new crane is equipped with two independent lifters for finished production offloading, but it has higher loading capacity. One more and no less important advantage: basic constructions of the Ural crane are divisible, which allows, when necessary, (i.e. when cargo traffic or infrastructure are changing) without added expenses and hazards, install the crane on a new place without destroying the steel constructions (whereas weld-fabricated constructions are cut). New crane cab also wins in comparison with the "old-timer": almost entirely transparent walls give the crane operator greater field of view. When the new development passes the tests and starts operating, the old equipment will be dismantled. By the way, almost similar crane, only with shorter length of span (7.5 meters), "URALKRAN" presently manufactures for the etching department of the first wire cable workshop. Crane waiting on the finished products warehouse for the operation start — is a kind of "trial" for the supplier, since short-range plans of the Cherepovets' production area include further modernization of the hoisting equipment fleet, and partnership with "URALKRAN" may find its continuation." Responsible and reliable supplier of high-quality overhead cranes meeting needs of MMK OJSC.